First edition of the author’s second book. Octavo, original green cloth. 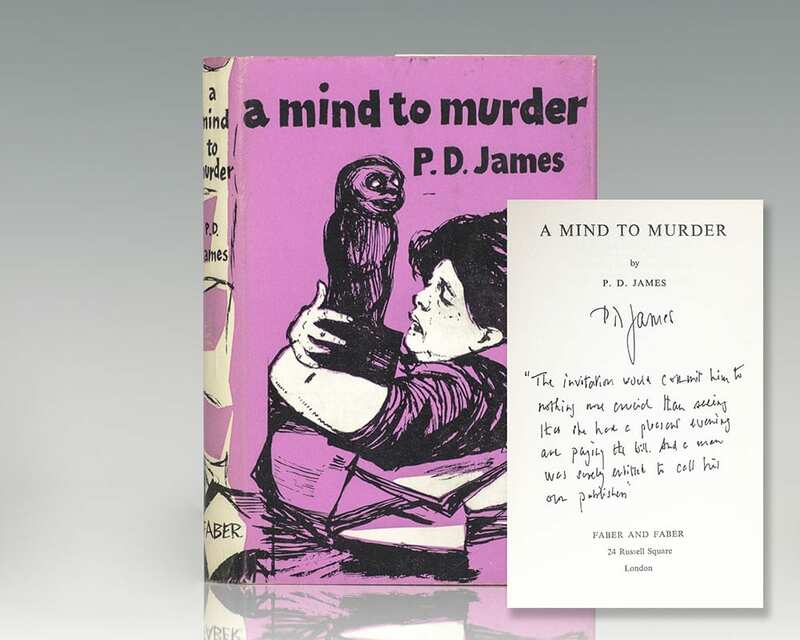 Signed by the author on the title page with a transcription from the novel as follows, “The invitation would commit him to nothing more crucial than seeing that she had a pleasant evening and paying the bill. And a man was surely entitled to call his own publishers P.D. 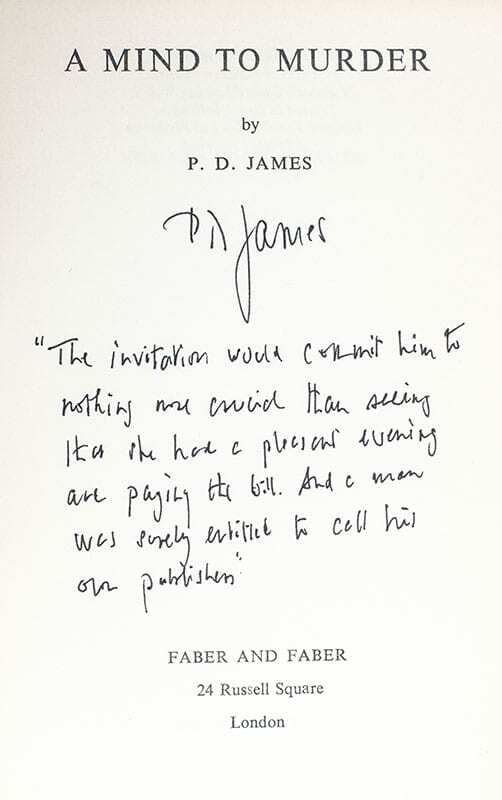 James.” The inscription is from the final sentence of this novel. Fine in a fine dust jacket. Jacket design by Charles Mozley. Rare and desirable, especially with such a lengthy inscription and in this condition. The second book to feature Scotland Yard investigator Adam Dalgliesh, A Mind To Murder is a "superbly satisfying mystery" (Chicago Daily News). "P.D. James is one of the national treasures of British fiction. As James takes us from one life to another, her near-Dickensian scale becomes apparent" (Malcolm Bradbury). London: Faber and Faber, 1964. First edition of the author’s third book. Octavo, original green cloth. Near fine in a near fine dust jacket. Signed by the author on the title page with a transcription as follows, “The corpse without hands lay in the bottom of a small dinghy drifting just within sight of the Suffolk coast.” Housed in a custom half morocco clamshell box. Boston: Faber and Faber, 1975. First edition of the James’ fifth novel in her acclaimed Adam Dalgliesh series. Octavo, original cloth. Signed by the author on the title page with the first sentence added as follows, “It was to be the consultant physician’s last visit and Dalgleish suspected that neither of them regretting it P.D. James.” Fine in a near fine dust jacket. Jacket design by Errol le Cain. London: Faber and Faber, 1962. First edition of the author’s first book. Octavo, original green cloth. Light shelfwear to the bottom cloth, near fine in a near fine dust jacket. Signed by the author on the title page with the added words, “And when that happened the right words would be found.” The inscription is the final line of this novel. Housed in a custom half morocco clamshell box. A superior example with a nice inscription from the author. Uncorrected Proof of the author’s third book. Octavo, original wrappers as issued. In near fine condition. Signed by P.D. James on the title page.